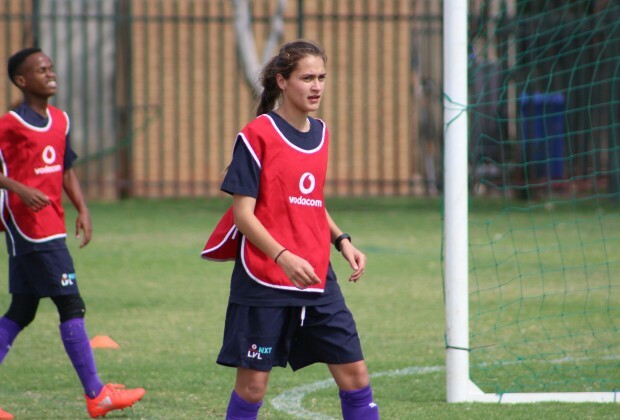 100 players at the Vodacom NXT LVL Boot Camp were trimmed down to 32 on Wednesday, with 14-year-old Cayla Goncalves being one of them to make the cut. “It’s a very great feeling that out of 100 players they managed to find me being a girl because this boys are very physical. It was very competitive for me as a girl. Some of the players never thought I could play football but I showed them what I am made of whenever I had the ball," she said. “I have been training very hard for the top 16 with my club and also at the Vodacom NXT LVL camp. I gave out my all at training. The coaches saw me and there I was given a chance to go through to the top 16. I think I can speak well very well with the team and I always make sure as a defender I stop the strikers from scoring”. Goncalves explains why it was difficult in the early stages of the Boot Camp. “In the Top 100 it was very difficult for me because they didn’t like to pass me the ball very often since I am a girl. They didn’t think I’m capable of controlling the ball and play like them. So I would have to find the ball for myself and show them what I could do with the ball on my feet. They started realizing that I can play just like them and started passing me the ball more often. I have learnt a lot from my coaches. I definitely learned that even if you fail, you need to get back up and work very hard and caring on fighting for what you want,” she added. “We are training very hard in the Top 16. We getting a lot of motivation from the coaches and also we motivate each other as players. We tell each other how we can improve in our game. If I do win the High Performance Center bursary it will change my life completely. It will definitely help me focus more on soccer as well as balancing of my schoolwork. Is also going to make me train harder and harder every day because I do want to be in the national team one day”.